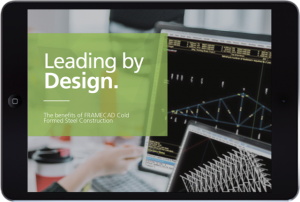 FRAMECAD, in continuing their pattern of industry-leading moves, has recently released a new e-book, displaying the benefits of using powerful design software to guide manufacturing companies’ systems and processes in constructing with Cold Formed Steel (also known as Light Gauge Steel). CEO of FRAMECAD, Mark Taylor believes that innovation is everything. In this eBook we explore the concept of design-led construction, and specifically, how the Cold Formed Steel (CFS) construction process varies compared to traditional methods. As FRAMECAD is leading the way with innovative software in CFS design and construction, we explain the specific benefits of the FRAMECAD design and engineering process, and the advantages of using FRAMECAD software over other industry alternatives.